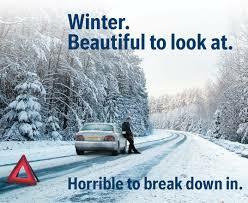 ARE YOU AND YOUR CAR READY FOR WINTER? We’ve not had any cold weather as yet but no doubt it’s just around the corner and using your car in cold conditions needs a little preparation. Check that all of your lights are working and are clean. Check all of your tyres are in good condition and the tyre pressures are correct. Good grip is essential in wet and/or icy driving conditions. Vision – good vision is essential so it is important to ensure that your wipers are cleaning the screen effectively. Keep a de-icer, scraper and even a soft brush in your car for removing snow and ice. If your screen is frozen, make sure your wipers are not frozen to the screen. Also, ensure your screen wash is topped up. 4. Check your heater and demisters are working. Using your vehicle’s air conditioning in the winter can be very effective for clearing a misted screen due to the dehumidifier. 5. Is your antifreeze up to the job? Call in and we can check the strength. Most manufacturers recommend changing the antifreeze every three years. It is also important to check all other fluid levels, e.g. your engine oil. 6. Will your car start on a cold, dark Monday morning?! Hopefully it will, but if your battery and/or starter motor are not up to the job then they could let you down. Call in for a free battery and charging system check. 7. Essentials to keep in the car – a warm coat, hat and gloves. Hiking or wellington boots in case you get stuck in the snow and have to walk. Also, it is useful to keep a small shovel in your vehicle should you need to dig out of any snow. If conditions are really bad then it is just not worth driving!